When the Nikon D200 came out in 2005, it was a big hit. (At the time, Gizmodo said it was "pretty rawkin.") 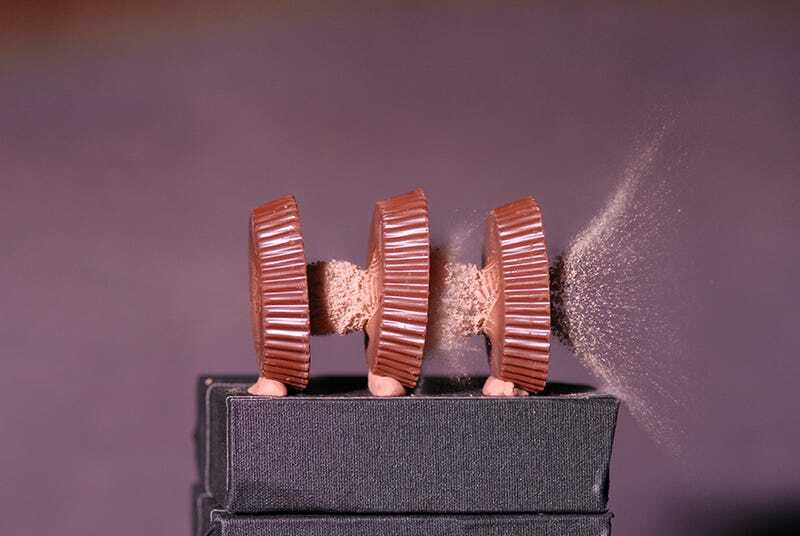 But would you believe that a decade-old camera design could handle ultra high speed photography, like the amazing bullet-blasted peanut butter cup shot above? Turns out, a well designed workflow is all it takes. The image of peanut butter cup slaughter was a fun Halloween treat from the smart folks at MIT's Edgerton Center. You might recognize the name as it comes from Harold "Doc" Edgerton, the famous MIT professor and champion of hands-on learning that took a similar high speed photo of a bullet passing through an apple all the way back in 1964. For the photo of a bullet passing through three peanut butter cups, Dr. Jim Bales, Kris Bronner, and Moseley Andrews recreated Edgerton's original set up except for one key difference. Instead of using a large format film camera, however, this year's team used a regular old Nikon D200 and a 105mm macro lens. Again, the Nikon D200 is a great camera. But it's not really equipped with the shutter speed to capture a bullet mid-flight. So what Bales and company did—like Edgerton before them—was create their own shutter of sorts. The scientists set up the photo shoot in a completely dark room and left the camera shutter open. Then, they used a SPOT strobe light from Prism Science Works to illuminate the scene for just 500 nanoseconds. That's one half of one millionth of a second. Very fast, indeed. We do this using the same method Edgerton used. We have a microphone just up range from the subject. The first sound to reach the mic is *not* the sound of the exploding gunpowder in the rifle. Rather, the first sound to reach the mic the sonic boom that accompanies the supersonic bullet as it flies through the air (the "crack" of a bullet passing by). We have a unit (a StopShot, by Cognisys, Inc) that triggers the strobe when it detects that sonic boom. And that's it! It wouldn't necessarily be easy to create this set up in your own photo studio, given the caliber of equipment needed and the danger of firing a rifle indoors. It's exciting to know that you little old DSLR is capable of some incredible things under the right circumstances. Also, go science!